I'm arriving at the Delhi airport with e-visa. I'm not going to leave the airport because I will take a domestic flight to a small airport in few hours. I have to have my visa confirmed before I will take the domestic flight. In order to confirm my visa, I wonder where is the immigration office located on this huge airport. Do I have to walk around and find it, or is it just on the way leaving my terminal? It is very easy to find the immigration center. You will leave your gate and head down a long corridor. You will than be routed down an escalator and into the room with the immigration desks. You will see sculptures of large hands coming out of the wall. Be prepared to present your evisa and your passport. You will also have to provide a destination address. It's unclear from your question whether you have experience flying internationally or not. When you arrive at an international airport on a passenger flight from another country, everybody on the plane (even the crew) has to go through immigration. 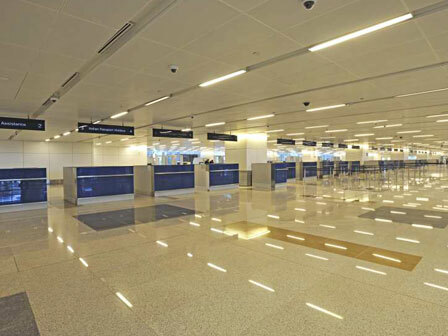 After leaving the plane, you will follow corridors and signs and will be directed toward the immigration desk. There you will usually find huge queues of people (or at least space for huge queues of people, if you're lucky and it isn't busy) where everybody will need to talk to an immigration officer before proceeding to wherever they are going next. It will be basically impossible (and a serious breach of security) to "miss" going through immigration. Not the answer you're looking for? Browse other questions tagged airports india e-visas new-delhi or ask your own question. Is a short stay visa required for collecting boarding pass if office is located outside international zone?